Bars in Florence Italy are famous for the ingenious ‘aperitivo;’ around 7pm, many bars offer something to eat for free to the customers (in most cases a buffet, and sometimes almost a dinner)! All the top bars in Florence have been deeply studied by our resident Florence nightlife expert: Helen Kershaw from Manchester! Bitter Bar serves up weird and wonderful cocktails for those who have an adventurous pallet. 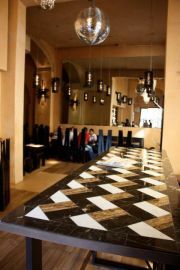 The Baroque-inspired décor provides a very trendy setting to sip quirky drinks and listen to jazzy and soulful music. Ingredients that can be found in the tasty cocktails at Bitter Bar include blue cheese, onions, wasabi and popcorn. All drinks on the menu are priced at a reasonable price, considering the detail and effort put into each one. On Thursday there is a Cocktail Therapy night where customised beverages are made, tailored to your favourite ingredient. Fridays host the Molecular Cocktails evening, where the bartenders offer up a selection of drinks inspired by molecular cuisine. Bitter Bar is never usually too crowded and so it is the perfect place if you want to experiment with your taste buds and relax in a classy but quiet environment. This bar is located in Piazza Sant’Ambrogio, mostly unknown to tourists as it’s not located centrally.Café Sant’Ambrogio is open daily and offers snacks, and wireless internet upon production of identification. The striking thing about this place is that there is always something interesting to observe, be it one of the odd, local “celebrities” or general goings-on. The bar itself offers a wide range of good wines in generous size glasses and at great prices. The bar staff are very efficient and friendly,and the aperitivo, whilst limited and seldom varied, is tasty and replenished frequently. Unlikely to be a destination bar for those who live outside of the Santa Croce zone, it remains the type of bar which has accrued a loyal fan base over the years owing to its open amicability, and will continue to amass more regulars over the years to come. This is one of the historical meeting places of the Florentine youth, nowadays attracting a chic, slightly older crowd. The interior design is trendy, but the magic of the place comes from outside. The bar’s large patio is wonderful! In spring and summer evenings, it’s possible to enjoy magnificent sunsets on very Italian, off-the-beaten-path Piazza del Carmine, while sipping incredibly exotic cocktails and stuffing yourself with abundant, themed aperitivos (like ethnic and Mediterranean). Want to be scream-cheered on by a guy who looks like Albert Einstein while you’re taking a highly experimental shot? Then you’ll love Eby’s and its eccentric owner. The bar/restaurant is a whole-in-the-wall located near The Lion’s Fountain. It’s a good, cheap place that technically serves “Latin” food, but really, they have everything from empanadas to hamburgers. If you’re sick of Italian food and need a burrito or a Greek wrap then you can hit Eby’s, however don’t expect anything authentic. At night, it’s a popular place among young Italians and study abroad students, mostly because of the crazy shots they make. The man who works at the bar (maybe Eby himself, no one knows – but definitely Einstein’s twin) creates some delicious and very creative ways to get you to want to drink. For example, the “chaser” to the Volcano shot (pictured above – five different types of alcohol plus Tabasco sauce) is a piece of banana sliced open, filled with nutella, and lined with sesame seeds! “Einstein” is also a pretty good cheerleader, and when you take your Volcano shot he slams it down on the counter and yells “HUP!”. During other fan-favorite shots, he consistently screams “VAI VAI VAI VAI VAI!” (go, go, go…), at the top of his lungs. All in all, Eby’s is a unique, inexpensive, central place to visit if you need a change from the typical Italian scene and a good story to tell your friends the next day. Sophisticated and worldly clientele have been coming to this posh, expensive restaurant bar for over fifty years, since it opened its doors to Florence in 1953. The tables are topped with rose colored silk tablecloths and the walls are adorned with original prints by local Florentine artists depicting classic scenes around the city. As much as the inside is alluring, be sure to check out the outside terrazza which overlooks the Arno and yields a view of the Ponte Vecchio in the distance. Whether you are looking for stylish ambiance to enjoy a fancy drink with friends or want to impress your parents with your new found European finesse, Harry’s Bar is the perfect, high-class locale for either occasion. This quirky, “sophist-artistic,” gem of a bar offers a kaleidoscopic plethora of delicious cocktails and a famed aperitivo to match. For being on the outskirts of town (just inside the Centro Storico on the corner of Piazza Beccaria), Kitsch is immensely popular, even over-patronised, and draws in a mainly Italian crowd arriving from the suburbs. Aperitivo here is unbeatable in Florence for quality and quantity (the biggest in the city) with tables and tables of cold and hot dishes. And for the few remaining smokers in Florence, there is a covered (and in winter, heated) seating area outside in the piazza, where you can sit to enjoy your food. All in all, a great place to start an evening out with a fabulous drink – a definite must-go. If you think you’re seeing double, you’re not! There are two Kitsch locations in Florence, so you can get their amazing aperitivo wherever you are! While the first one is located on the outskirts of the city, Kitsch DEVX (two) is located right in the center, near Piazza San Marco. This location has pretty much the same interior style of Kitsch 1 (still very “Kitsch,” ha) with velvet seating, disco balls, and cool colored lights. The aperitivo is also just as big and delicious, the creative drink list just as extensive, and the drinks themselves just as tasty! Try the Hawaiian Colada – basically an enormous, very strong, frozen strawberry Pina Colada. One main difference between the two locations is the type of crowd you’ll find in them. Since this location is more central, you get natives and lots of study abroad students, while Kitsch 1 is mainly Italians. During the day, Moyo is the perfect place to study or take advantage of their free WIFI. It has a flawless, modern interior; amazing bowl-sized cappuccinos; a great lunch menu; attentive service; not to mention homemade, strawberry cheesecake! 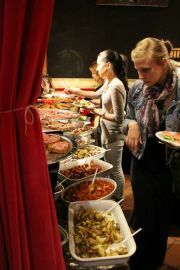 Because of its very central location, casual vibe, and good food and drinks, it’s popular among Italians and foreigners. It’s a great meeting place between cultures, especially during their comprehensive, themed aperitivi (Italian, Mexican, Japanese) every evening. They play loud music and the place gets crowded, with people spilling out onto the street and patio; but the overall atmosphere remains laid-back and no pressure – even into the late hours of the night. Naima looks like more of a cocktail lounge than a bar, but gets bar-crazy nonetheless. It’s very popular among study abroad students, as lots of student travel companies (like Bus2Alps and Florenceforfun) promote it. It has a cool vibe and modern interior area with dimly-lit blue lights. On any given night, it’s packed until close (2 a.m.), with people watching sports on one of their flatscreen TVs or hanging out on the couches in the cool lounge room. One reason Naima has so many regulars is because of their amazing drink specials every night. Mondays are Mexican Mondays and anything tequila or sangria related is super cheap. Thursday is Ladies night. Sundays are Sunday Fundays and happy hour continues all night long. Crazy Hour, is from 6-10pm, daily, where pretty much anything to drink costs €2.5! Insanity! The other reason the bar is so popular is Sergio, the owner who becomes friends with nearly everyone who walks into his bar. You’ll always see American girls that charmed him into letting them bartend, and everyone snapping pics with Sergio all night. They play typical American pop music, as well as some Italian hits (for the locals there looking to land themselves a new foreign girlfriend). It’s one of the few places in Florence that rarely disappoints and is always a good time. Directly next-door to Zoe, it wouldn’t be surprising if one outweighed the other. However, rather than compromise one another, they compliment each other. Whilst Zoe may be justly considered to be more younger, Negroni maintains a certain esteem amongst Italians as a tasteful retreat to mix with like-minded sophistocrats. Also sporting an outdoor seating area, a more organic feel is emulated here through the use of natural materials in it’s décor. There are always people spilling out and around, but you’re not going to see any crazy drunk people here. It’s a great place to network and people watch. There are some faces you can’t help but see time and time again on the Florence circuit; this place is their kind of base. If you want a classy night in a different kind of setting Negroni is recommended. Red Garter is a huge bar, one could say it’s even “club-like,” located in the Santa Croce area of Florence. It’s right in the middle of the nightlife scene and attracts Italians and foreigners galore. They have a big bar, dance area, and DJ right when you walk in. Even though that might seem like enough, then, there’s a hallway that leads to yet another large back room with tables for nights of beer-pong, an upstairs balcony seating area, another dance floor, and a stage for karaoke and DJ’s. It is always packed, in part because of all the things to do there, in part because of it’s prime location; if you are walking past Piazza Santa Croce, you can’t miss Red Garter as there’s always a huge crowd out front. The music selection is typical house music and pop music. But when you walk into the back room and karaoke is going on, you never know what you’re going to hear from people! The drinks are average priced, definitely not high, and they’re made with a pretty good amount of alcohol. Next door is a steak house, House of Sizzle. At night, when they finish serving food, this connecting restaurant turns into an extra seating and hang out area with another bar. Nights at Red Garter are always fun, as there is so much going on everywhere. You’re in one room dancing to top 20 hits, and you walk into another and you’re surrounded by beer pong players and someone screaming classic rock lyrics on stage. You never know what you’re going to get here, so if you want a crazy night to talk about, you’re going to love Red Garter. REX is currently celebrating 15 years of success and it is easy to see why. This place boasts some of the finest bar staff in Florence whose experience and skill show in the drinks that they serve. With a wide range of ‘nights’ including live music and the like to complement the Gaudi-inspired interior, there is such an easy, comfortable atmosphere. The main selling feature of REX has to be its awesome interior. Paintings by local artists cover the two side walls and are on sale, whilst the intriguing back wall is an exposed contorted iron masterpiecemap of the world. The bar is a beautiful circular mosaic island and truly is the heart of this great place. Aperitivo here, like most bars is limited to small snacky bits, but on some nights of the week it would not be unusual to find oysters laid out ever-so-casually on the bar. REX is a place to have good conversations and laughs with friends. Not far from the Duomo, this tiny bar is mostly frequented by foreign students because of their extensive and crazy shot list (shots aren’t popular with Italians). They have a huge book of hundreds of fun and creative shots to start the night off. And although they’re known for the best shots in town, they do offer other typical cocktails and drinks. This newly renovated, sheek Italian bar has a wine bar and wide range of drinks, which are all served with a plate of light snacks. They also have a high-class cafe menu, serving appetizers, fish tartar, Italian cold cut plates, hamburgers, pizza, sandwiches and daily pastas or other first courses. In the Summer, the nice patio outside, with a view of Porta San Niccolò, adds even more glamour to the scene of well-dressed, young business professionals…Many Florentines spend their evenings here; you’ll find more locals than foreigners. Volume is located across the Arno river, in the part of Florence called the Oltrarno (the other side of the Arno). It’s in Piazza Santo Spirito, a popular location with Florentines for the delicious food, bars, and being simply just a good place to hang out. Volume has a really cool, hipster-vintage interior due to it’s unique history: first a wood sculptor’s store and then a hat workshop. Among fedora forms and wooden animals, they also have a bunch of books lining the walls… it’s basically a hipster’s paradise. The crowd is also in that category, as you’ll find more (wannabe?) intellectual Italians who would rather try talk to you about philosophy then grind up on your leg. The drinks are strong and well-made, and the aperitivo is casual with finger foods, dips, and breads. They have live music (local Italian bands) or play a relaxed-alternative selection of songs. Bonus points: they have a jukebox and they make sweet and salty crepes. Zoe seems to have earned a reputation amongst some Florentines for having pretentious clientele. Located on the Oltrarno in the vicinity of San Niccolo, Zoe is in fact a very cool bar for those who prefer to mingle with a choicer crowd. And the neon red Zoe sign is clearly visible from far away so you’ll have no trouble finding it. Chrome furnishings give it a sleek, defined modernity, whilst the quirky touches (like the bathrooms! Not only refreshingly clean for Italy, but designed – a real rarity) set it apart. It is a charming place to pass an evening indulging in a good Mojito or a well-selected wine chosen from an extensive list. Aperitivo here is amongst the best on offer in terms of quality, quantity, and variety.Open all week, early evening till late, you can find good music, a great crowd and excellent service.